I don’t drink soda, not even diet soda, and there’s a good reason. It’s not healthy for you. 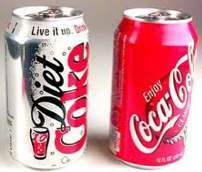 Despite the fact that the average non-diet soda has 170 calories in a 12-ounce can (all of which are derived from refined sugar), there are other negative aspects to drinking soda that can’t be overlooked. Some people think that eating healthy is enough and that drinking an occasional soda is “okay." But what you drink can really be your downfall when trying to maintain a healthy weight or lose weight. And if you drink a couple of sodas each day, you have consumed around 1/5th of the calories that you need for the entire day. But these are empty calories that will leave you feeling like a bloated whale, fast. But diet soda should be okay, right? Not always. Diet soda is usually made of a mix of chemicals, including phosphoric acid, artificial sweeteners, and preservatives like sodium cyclamate, sodium citrate, and sodium benzoate. These chemicals can cause long-term problems for your health, including osteoporosis and kidney disease. Another drawback to soda in general is that it doesn’t really quench the thirst. Soda contains salts, sugars, and chemicals, all of which require additional “fluid” in order for the body to process them. Of course, the soda company is in hope that to satisfy your thirst you will just drink more soda, and more soda, but that’s just exacerbates the problem. Caffeine has diuretic properties that can cause you to become dehydrated. Thus you can see that soda is just bad for you all the way around, garbage in a can. The best drinks are from nature, including 100% juice drinks and of course, nature’s perfect beverage, water. Water has zero calories and no additives. For those times that you find plain water just too boring, try flavored water. I have blogged in the past about making your own flavored water, and I have also shared a few of my favorite flavored water choices with you, including flavored Hint water. I try to drink the recommended 64 ounces of water each day so that I can maintain optimal health while staying hydrated and feeling “full”. Just wanted to let you know that you don't actually need to *drink* 64 fl oz per day. If you eat lots of fruits and vegetables or foods with a high water content, they contribute to that 64 oz.